If you are planning an event of any kind, lighting will be an absolutely essential element of your design. This is especially true if you are planning a large party. Filling up air space and creating an intimate feel in bigger venues can be a challenge. Let ShopWildThings help with our collection of Large Event Chandeliers. We have a selection that simply cannot be beat, with the largest stock quantities you're likely to find anywhere, with the highest quality around. We are meticulous when it comes to bead clarity, so don't be fooled by cheap knock-offs! View & Order ShopWildThings Extra Large Chandeliers below, or see our entire HUGE Chandelier Collection HERE! 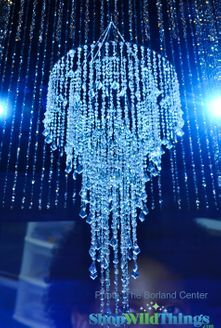 ShopWildThings Large Chandeliers for Events are available in lengths starting at 4 feet and going to 10 feet in length. We can also create custom pieces for your Decor, we do our own fabricating right here in Arizona! Each of our Large Event Chandeliers has a coordinating Beaded Curtain or Crystal Column in lengths up to 24 Feet, in stock and ready-to-ship in most cases. We are crazy about customer service, our staff is ready to help should you need additional assistance. Chandelier - Extra Large 21" x 19.5" Vintage Metal Mesh and Flowers "Emmanuelle"